Pier 1 Imports of Fort Worth, Texas, is recalling about 158,000 glass knobs sold in the U.S. and Canada. The knobs can break while in use, posing a risk of laceration to users from broken glass pieces. The company has received seven reports of injuries as a result of glass knobs breaking during installation or while in use. This recall involves Pier 1 Imports Basic, Kira and Facets glass knobs commonly used with dressers, cabinets and small drawers. 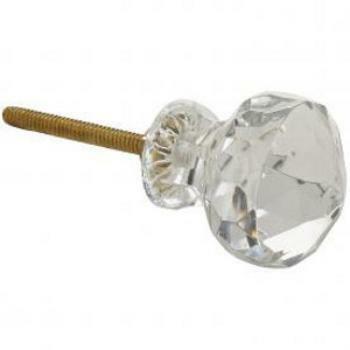 The glass knobs have a metal stem affixed to one side and were sold in seven colors: clear, teal, pink, green, aquamarine, champagne and silver. No other decorative knobs are included in this recall. The knobs, manufactured in India, were sold exclusively at Pier 1 Imports stores nationwide and online at www.pier1.com from September 2011, through October 2016, for between $6 and $7. Consumers may contact Pier 1 Imports toll-free at 855-513-5140 from 8 a.m. to 7 p.m. (CT) Monday through Friday, 9 a.m. to 5 p.m. (CT) Saturday or 10 a.m. to 6 p.m. (CT) Sunday, or online at www.pier1.com and click on “Product Notes & Recalls” at the bottom of the page for more information.